a. Monthly stipend: The students selected for the full-time Ph.D. programme at CYUT will be awarded a fellowship of new Taiwan dollars 10,000 per month. b. Tuition waiver: For Ph.D. program students, tuition waiver includes basic tuition fee, basic credit fee, and free accommodation. c.　Applicants will be considered to be awarded both monthly stipend and tuition waiver with free accommodation. 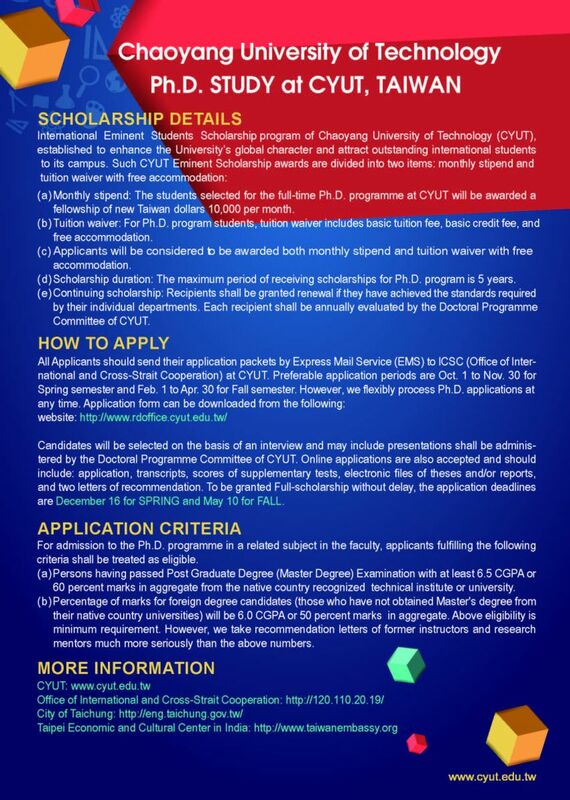 d.　Scholarship duration: The maximum period of receiving scholarships for Ph.D. program is 5 years. e.　Continuing scholarship: Recipients shall be granted renewal if they have achieved the standards required by their individual departments. Each recipient shall be annually evaluated by the Doctoral Programme Committee of CYUT. Step 1. Download and print application forms PDF. Chaoyang University of Technology (CYUT) was founded in 1994 with the goal of educating elites. From the university’s establishment, the motto “diligence, character and action” is aimed to foster the students’ core abilities as well as to cultivate students’ pride, respectability, politeness, harmony and devotion. CYUT also aims to be up to date with industry trends in their expertise, technological application, communication, as well as learning autonomy, so to equip the students to become professionals needed by industry. CYUT comprises of 5 colleges and 22 departments. The current number of students enrolled is around 17,000, including 1400 graduate students. CYUT offers 22 master's programs and 5 doctoral programs. CYUT’s excellent teaching and research performances have been readily receiving recognition nationwide. (C) 2016 RESEARCH AND DEVELOPMENT OFFICE, CYUT All RIGHT RESERVED.